Vandalism and graffiti can become much more than just unsightly. For some people, it can be a truly devastating to see their property vandalized or find it covered with graffiti. But it can also have serious consequences for the integrity of the building too. Even just a broken window can cause significant water and mold damage if not dealt with quickly. Penn Jersey provides commercial and residential graffiti and vandalism cleanup across Philadelphia. When you experience vandalism, you naturally want your property back to its original condition as soon as possible. But you don’t need to worry about doing the clean up yourself, we are here to help you. Vandalism can come as a huge shock to property owners. Not only must they deal with the damage to their property, but also the worry of it happening again. But, you can save yourself stress by hiring a vandalism cleanup professional like Penn Jersey. We have worked hard for the last 50 years to keep Philadelphia clean and beautiful. Leave it to our expert team to remove, clean and repair the damage quickly and effectively. Whether it’s your home or business, our team of cleaning technicians will be there to put your property right. We do not underestimate how upsetting your premises being vandalized can be. With this in mind we endeavor to work quickly and efficiently to bring your property back to its best, and get you back in business before the damage and/or graffiti is seen and noticed by too many people. While it isn’t your fault, it is understandable that it can impact on a business’ reputation and we want to work quickly to avoid this. As the services above suggest, vandalism does sadly sometimes go beyond graffiti and when it does lead to further damage, through fire or water, our teams are prepared to help and restore your property as quickly and efficiently as we can. We are professionally trained to work in all of these environments and possess the skills and equipment necessary to effectively clean and restore your property. Waiting to remove graffiti or to secure your building after an act of vandalism puts your home or business at risk for even more vandalism. In fact, if your property is tagged with graffiti, other taggers will soon follow. Your property is also at risk if vandalism results in a broken window or door and it is no longer secure. Removing graffiti and making repairs as soon as possible is the best way to prevent additional damage from vandalism. Whether it’s your home or business, Penn Jersey has all the skills, experience and tools to restore it quickly. We know that it’s important to remove the vandalism waste as soon as possible before it stains or damages the underlying surface and causes permanent damage. 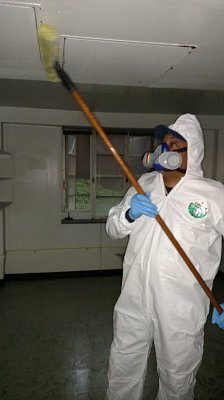 It’s important to always hire a professional like Penn Jersey to handle vandalism cleanup and graffiti removal. It’s the best way to ensure that cleanup takes place quickly, deterring future vandalism and additional damage. Trying to clean up vandalism yourself can often be disastrous and can result in additional damage if you use the wrong cleaning agents or methods. While you may want to remove the graffiti or act of vandalism as quickly as possible, your efforts may do more harm than good, which is why working with professionals really is the best idea. Our team of expert cleaning technicians have all the tools, materials and methods necessary to remove paint, food, and waste effectively, while not damaging the surface. Our team of trained cleaning experts will identify the safest and most efficient vandalism cleanup and removal methods for your specific property. We will ensure your property returns to its previous state. What’s more, we genuinely appreciate the need for speed and can work quickly so you are able to return to your home or business as quickly as possible. Our highly trained and well-equipped staff can remove graffiti from all types of surfaces, including vehicles, trucks, boats, heavy equipment, buildings, bridges and parking lots. At Penn Jersey, we provide a highly effective graffiti removal solution to help remove and prevent graffiti on your home or business. We can remove graffiti from virtually all surfaces. This can include, concrete, metal, brick, wood, stone, glass, painted surfaces and even vehicles. Our cleaning treatment will not harm the surface of your property. And once we complete the removal process, we will provide an additional treatment to help the fast treatment of any future incidences. Graffiti, along with other types of vandalism, can seriously deface buildings. But it can also lower the value of a property, be intimidating to residents and visitors and can even attract crime and encourage street gangs and other vandals. Penn Jersey has been caring for Philadelphia’s buildings and neighborhoods for more than five decades and in that time, we’ve become experts in removing graffiti. Our vandalism and graffiti cleaning team are dedicated to providing a friendly, professional and fast graffiti cleaning services to all our clients. We care about our community and want to keep it looking its absolute best. We want every home and business in our community to look its best and are always disappointed when graffiti and vandalism occurs. We are proud to work with Philadelphia businesses and homeowners to quickly and efficiently remove the effects of vandalism and restore our community’s properties back to their best. We are proud of our community and proud to help keep it as clean as possible. If you have any problems with vandalism and graffiti which need a full cleanup, contact us immediately.